Liverpool extended their lead at the top of the Premier League and Manchester City suffered a second successive defeat, while there were big wins for Tottenham, Manchester United and Everton. 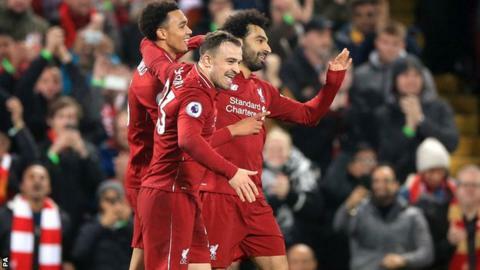 Jurgen Klopp's side now have a six-point cushion after beating Newcastle 4-0 with goals from Dejan Lovren, Mohamed Salah, Xherdan Shaqiri and Fabinho. Manchester City lost 2-1 to Leicester at the King Power Stadium to drop to third in the table. Bernardo Silva had put the champions ahead, but Marc Albrighton equalised before Ricardo Pereira scored an 81st-minute winner for the Foxes. Tottenham moved above Manchester City into second, six points behind Liverpool, by thrashing Bournemouth 5-0. Christian Eriksen's opener, a double from Son Heung-min and goals from Lucas Moura and Harry Kane gave Mauricio Pochettino's side their second big win in three days, having beaten Everton 6-2 on Sunday. Ole Gunnar Solskjaer continued his winning start as interim manager at Manchester United as they beat bottom club Huddersfield 3-1 with Paul Pogba scoring twice. Everton scored three goals in the opening 22 minutes in a 5-1 win over Burnley, with goals from Yerry Mina, Richarlison, two from Lucas Digne and a penalty from Gylfi Sigurdsson. Crystal Palace drew 0-0 with Cardiff and Fulham moved off the bottom of the table with a 1-1 draw at home to Wolves. Brighton came from behind to claim a point at home against Arsenal, with Jurgen Locadia equalising after Pierre-Emerick Aubameyang's opener for the Gunners. Chelsea returned to fourth place in the table and moved two points clear of Arsenal courtesy of a 2-1 win at Watford in the late kick-off, with Eden Hazard scoring both the Blues' goals. The Belgian passed 100 goals for the club as a result, becoming the 10th player to do so in their history. In the Scottish Premiership, Scott Sinclair scored a hat-trick as leaders Celtic beat Aberdeen 4-3 to move three points clear of second-placed Rangers. In the Championship, Kemar Roofe scored twice in stoppage time to give leaders Leeds a dramatic 3-2 win over Blackburn Rovers. Second-placed Norwich fought back from 3-0 down to draw 3-3 with Nottingham Forest, with Onel Hernandez scoring an injury-time double.